One of its partners, the globally known WeighPack Systems, leads Paxiom Group’s machine for packaging lineup. Starting with our vertical form fill and seal baggers, our vertical form fill and seal solutions are now made easier and smooth. Designed for easy cleaning on the user’s end, we are proud to present our two brands, the VerTek and XPdius, which are commonly used for higher speed vertical form fill and seal applications. Our Swifty Bagger comes next with its specific design for packing with already-made pouches. It is available in different models and offers automated solutions for different pre-made bag styles such as stand-up pouches, gusset, and flat bottom, with or without zipper enclosures. It is perfect for packing snack foods, coffee (ground and whole bean), chocolates, candies, fruits, vegetables and frozen foods. The R2B horizontal form and fill machine reduces cost for two reasons. One, because of its pre-made stand-up bags and its four-in-one (make, fill, seal, and print) feature in just one process. This machine is mostly known for packaging snack foods and cheese. Next is SpinDexer which is designed to fill challenging products such as snack food with irregular shapes and sticky texture into stiff containers. It is also best for packaging cheese, candies, chocolates, and coffee and is engineered to package 80 containers per minute. We also have the cleverly designed VS Bagger. Therefore, It is perfect for packages that require a band, twist tie, or tape that produces a homemade feel to the products. Consequently, the VS Bagger automatically open, fills, and transfers the bag to another sealing machine for final closure. As a result, it is ideal for cheeses like mozzarella and cheddar. However, our StarAuger is built to vertically form, fill and seal products like ground coffee and whole beans into fillow or gusseted pouches. It is a compact machine that promises easy clean up to its user. 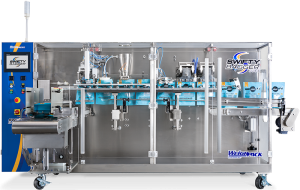 In conclusion, we have our SleekWrapper that is engineered to produce a flow wrapping process for each of our customer’s packaging needs. This machine for packaging is also great for candies and chocolates.